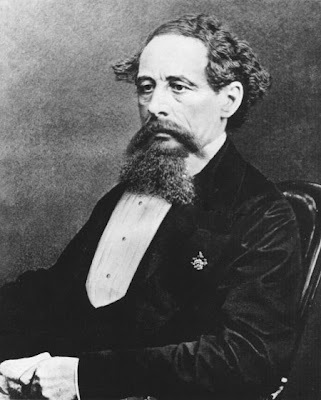 Charles Dickens (7 February 1812 – 9 June 1870) was an English writer and social critic. He created some of the world's most memorable fictional characters and is generally regarded as the greatest novelist of the Victorian period. 1. "A day wasted on others is not wasted on one's self." 2. "A loving heart is the truest wisdom." 3. "Charity begins at home, and justice begins next door." 4. "Credit is a system whereby a person who can not pay gets another person who can not pay to guarantee that he can pay." 5. "Electric communication will never be a substitute for the face of someone who with their soul encourages another person to be brave and true." 6. "Have a heart that never hardens, and a temper that never tires, and a touch that never hurts." 7. "I never could have done what I have done without the habits of punctuality, order, and diligence, without the determination to concentrate myself on one subject at a time." 8. "It is a melancholy truth that even great men have their poor relations." 9. "It opens the lungs, washes the countenance, exercises the eyes, and softens down the temper; so cry away." 10. "No one is useless in this world who lightens the burden of it to anyone else." 11. "Reflect upon your present blessings of which every man has many - not on your past misfortunes, of which all men have some." 12. "Subdue your appetites, my dears, and you've conquered human nature." 13. "There is a wisdom of the head, and a wisdom of the heart." 14. "Vices are sometimes only virtues carried to excess!" 15. "Cheerfulness and contentment are great beautifiers, and are fatuous preservers of youthful looks." 16. "'Tis love that makes the world go round, my baby." 17. "There are people in the world so hungry, that God cannot appear to them except in the form of bread." 18. "The most important human endeavor is the striving for morality in our actions. Our inner balance and even our very existence depend on it. Only morality in our actions can give beauty and dignity to life." 19. "The American elite is almost beyond redemption. . . . Moral relativism has set in so deeply that the gilded classes have become incapable of discerning right from wrong. Everything can be explained away, especially by journalists. Life is one great moral mush--sophistry washed down with Chardonnay. The ordinary citizens, thank goodness, still adhere to absolutes.... It is they who have saved the republic from creeping degradation while their 'betters' were derelict." 20. "There is nothing good or evil save in the will." 21. "Minds, like bodies, will often fall into a pimpled, ill-conditioned state from mere excess of comfort." 22. "Oh the nerves, the nerves; the mysteries of this machine called man! Oh the little that unhinges it, poor creatures that we are!" 23. "Happy, happy Christmas, that can win us back to the delusions of our childhood days, recall to the old man the pleasures of his youth, and transport the traveler back to his own fireside and quiet home!" 24. "I will honor Christmas in my heart, and try to keep it all the year." 25. "God bless us every one." The Church and the "Civil Society"